I know, it’s unusual to find a place like this on a city guide map, but the Spotted by Locals city guide is as unique as it is unusual, so I’ve decided to write about Er Fava, a person who is an institution in the Pigneto neighborhood. Er Fava has been been running his hair salon Fabrizio, after his real name, for ten years. 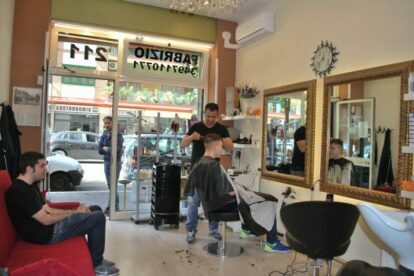 He gives his customers more that an haircut: he gives good vibrations, energetic point of views about life, smiles and wise advice. Even if I’m living on the other side of Rome I come here to do my hair cut. I know it sounds funny for all the strangers, but in Italy going to the barber shop (also to have your face shaved) is part of the culture, so if your objective would be to feel as local as as possible, this is an experience I’d suggest to do, both for men and women. Wouldn’t it be very nice have a new fashionable hairstyle while visiting Rome?